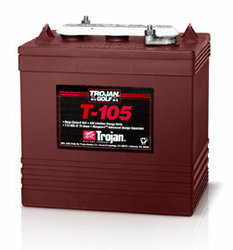 Trojan T-105 6 Volt Deep Cycle Battery for Off Grid Solar & Wind Power Free Delivery to most locations in the Northeast*. *Call 888-737-5681 or Email us usabatterysales.com@gmail.com with your location before ordering to see if you qualify for our free shipping offer. New York, New Hampshire, New Jerseys, Rhode Island, Maine, Massachusetts, Delaware, Vermont, Pennsylvania, West Virginia, and Virginia.